Department of Justice sues California over sanctuary policies. On Tuesday, the Department of Justice filed a complaint alleging that California has unconstitutionally obstructed the United States’ enforcement of federal immigration law. California will likely argue that it has merely decided not to act as an arm of federal law enforcement; the case will have ramifications for sanctuary jurisdictions across the nation. Irish abortion referendum comes closer to reality. On Wednesday, the Supreme Court of Ireland ruled that the unborn do not have any rights outside of the constitution’s eighth amendment, which declares their right to life in tandem with the mother’s right to life. 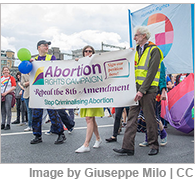 The ruling allowed the government to settle on wording for a referendum, currently scheduled for May, at which voters will decide whether to repeal the eighth amendment. Outgoing Chilean president proposes new constitution. On Monday, outgoing Chilean President Michelle Bachelet proposed replacing the country’s dictator-era constitution with a far more progressive document. The proposal is unlikely to be approved by Congress before Bachelet leaves office, but some hope it will pressure the incoming president, Sebastian Pinera, to take up the issue of constitutional reform. For more news, visit our partners at ConstitutionNet.